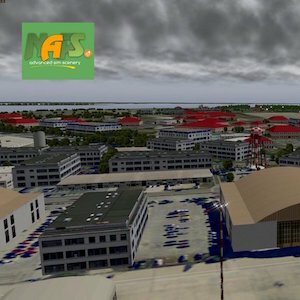 NAPS presents to you ….. Another High Definition airport by NAPS in the Tampa Bay Area. MacDill Air Force Base is an active United States Air Force base located approximately 4 miles south-southwest of downtown Tampa, Florida. Many other NAPS airports in the Bay Area. This airport scenery works fine with Florida, Zone-Photos.fr. Check this YouTube video. Customized airport with many hangars, buildings, military objects. Includes some of Marc Leydecker’s © assets. ATC Traffic. Orthoscenery courtesy of USGS. NAPS_library: Make sure you have the latest NAPS lib version 2.4! Want to see some additional screenshots before you download? Then you must check this additional screenshots link.